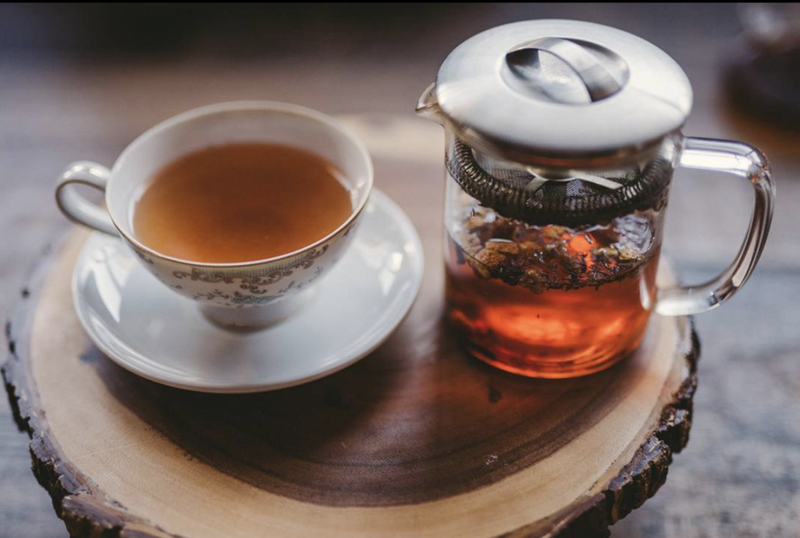 I grew up with the tradition of tea time or "la merienda" - the perfect afternoon snack. It usually consists of tea, coffee, or mate, with toast, a croissant, scone, cake or some sort of pastry, cookies - all sweet and very delicious. Ideally, the "Merienda Tradition" is a time to relax and enjoy the company of family and friends. These last few weeks I've been putting together my favorite spots in South Florida to experience my favorite time of the day. I visited BREW for the first time almost by accident. I recently went back with a friend and I am so happy Brew is back in my life. First of all, The vibe and atmosphere of BREW is one that can't be matched by another coffee shop in the south Florida area. They have a beautiful wall of books, dark wood shelves, and comfy vintage furniture. The coffee and tea are great. These baristas definitely know what they are doing. My typical order is usually a cappuccino or latte. They also have great pastries and snacks to choose from. "Appreciate the little things in life because one day you will look back and realize they were the big things." I couldn't have said it better. 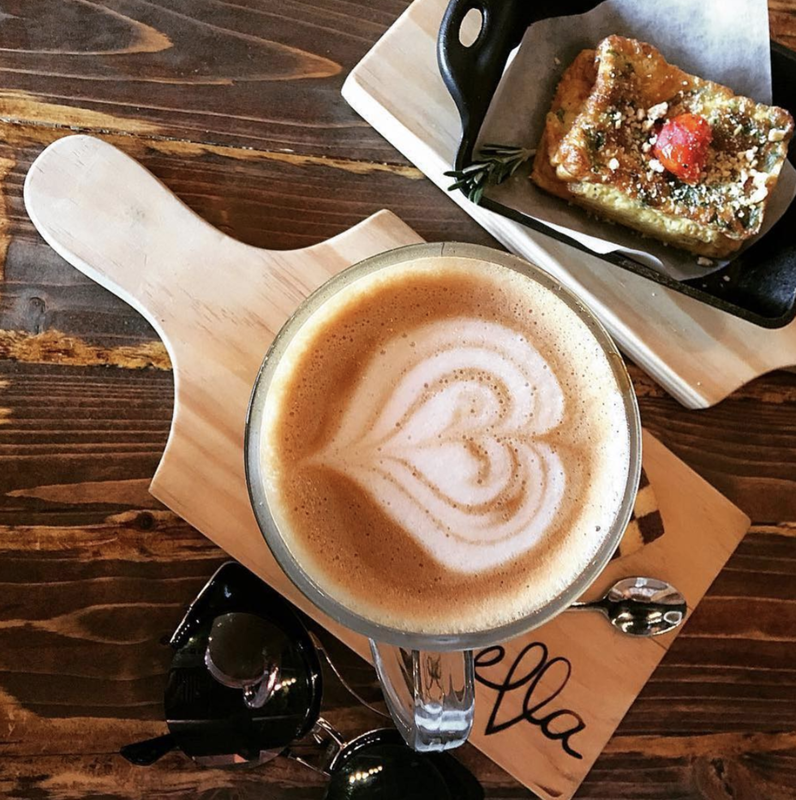 Ella Cafe is an amazingly cozy coffee house for the artsy soul in you. If you're looking for some delicious coffee, yummy sides, consider visiting them! The moment you go in, you notice the quaint yet bold atmosphere. They get a bit busy in the afternoon so expect to have people in line with you, but the service is good and efficient. The menu is very visual with an explanation of various coffees sketched in chalk. As you approach the register you can see the kinds of snacks they offer behind the counter, which include muffins, cookies, croissants, etc. All perfect for the merienda experience. The Cheese Course will always hold a special place in my heart because that’s where I worked every summer during college. They focus on outstanding artisanal cheese from around the world. They serve all sorts of cheeses alongside some perfect ‘merienda’ snacks like a prosciutto croissant, a Cajun smoked ham croissant, a smoked salmon bagel, and very delicious jams. If you want to try something from their bistro menu, they serve excellent hot and cold sandwiches on fresh baguettes using quality ingredients. My all-time favorite is their chicken salad sandwich. It’s seriously amazing and the salad is homemade. I discovered this café through work because we did a team meeting in one of their meeting sites. We started the day at the café and it was such a treat. Named after the Ironside District situated in the historic Little River Industrial District, Ironside Kitchen prides itself in its authenticity and quality of the foods they serve their customers. Their bakery item selection is great, from strawberry bites, apple turnover, whole grain and butter croissants. Pair it with their selection of coffee, and you won’t be disappointed. It’s fair to mention they serve DELICIOUS pizzas and they’re very authentic. I don’t know if a lot of people know about this place but I am glad we discovered it! This place is the very close to home. An Argentine bakery serving all sorts of delicious goodies. The bakery is authentically Argentinean and has been family owned and operated for over 40 years. They offer delicious empanadas and facrutas (or bizcochos for us Uruguayans J) All the pastries are made fresh in house and sometimes you will catch them coming right out of the oven. They also make amazing and delicious cakes and desserts. My favorite factura to try is the vigilante con crema. I promise you, you won’t regret it. I like to think that in a past life I used to be French (or maybe I wish this haha). I loved every second of enjoying a merienda at Nanou in Fort Lauderdale. It’s truly a lovely and authentic French bakery AND it’s only one block from Las Olas beach. It’s the perfect location to enjoy a merienda after enjoying the day at the beach. All their pastries are freshly baked and so delicious. I had my ultimate favorite, the chocolate croissant, which is sweet, buttery and warm. Their quiches also look so delicious. The café is managed by their French owners. Quite a gem and I really recommend it. Another great Paris bistro in Wilton Manors. The cafe is among a group of other great finds for those that are linking for local alternatives to chain restaurants. A coffee shop, taco and local art shops share the space with this bistro. I love this café because of their amazing crepes and cappuccinos. Order at the counter, and then your food will be served to you where you sit. All the team members are smiling, helpful, welcoming and pleasant. They have an outdoor seating area which will make you believe that you’re hidden away in a tropical retreat. Wells is located in between FAT Village and MASS District. The shop is open and airy - there are a ton of windows, so plenty of light comes in! Something very unique to Wells is that they serve Iced horchata coffee. The ice horchata is a cold brew that's been keged and mixed with the horchata already. Horchata, the Mexican rice drink, is refreshing and sweet. It's got cinnamon in it and it's a true delight. Another delicious drink would be the vanilla lavender latte made. So unexpected but so delicious! I am so happy that South Florida is really starting to show some very unique and authentic coffee shops! Subculture Coffee is everything you could ever want in a local coffee shop and cafe. The cafe has two sections and has a little something for everyone. On one side is food and smoothies and on the other it's cafe and baked goods (gluten free and vegan options). They also tend to play great music! One of the things I loved the most about them is something I read on their site, “We strongly believe in fostering a community of diversity and expression, one that brings soul to our city.” Nowadays this notion rings SO true to me. I wish I lived closer to west palm so that I could go to Subculture more often. Thank you to a fellow blogger, Delahaye from @huesofdelahaye for this submission! No trip to Miami is completed without visiting little Havana. Where you’ll find the best Cuban coffee you’ve ever tried at La Colada Gourmet. 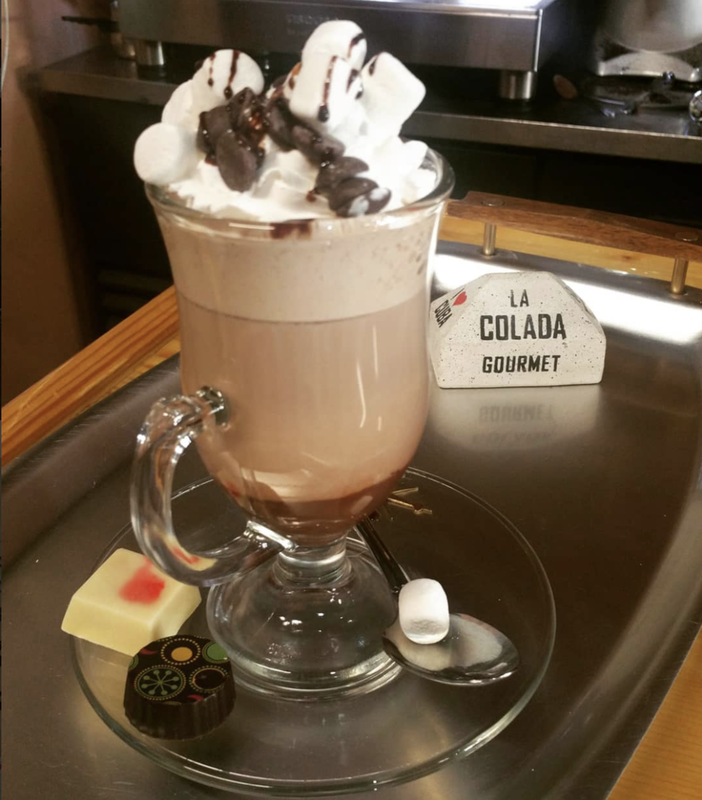 La Colada Gourmet is run by a mother and daughter, serving up some strong Cuban coffee with their own imported beans from Cuba. If you like your coffee with a shot of Baileys or condensed milk and rum, then visit this shop. The search continues to keep finding cozy and delicious merienda spots all around south Florida. If you have a favorite spot, please be sure to tell me in the comments! Thank you for reading and I hope you get to enjoy a delicious and merienda moment.